LAS VEGAS (WLS) -- In a tribute to America's favorite pets, the U.S. 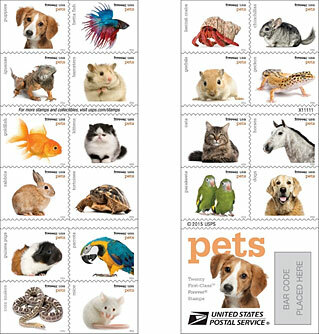 Postal Service dedicated Forever stamps Tuesday featuring photographs of 20 different domestic animals. The stamp series features two dogs, two cats, two birds, two fish, four reptiles, five rodents, a crustacean, a rabbit and a horse. 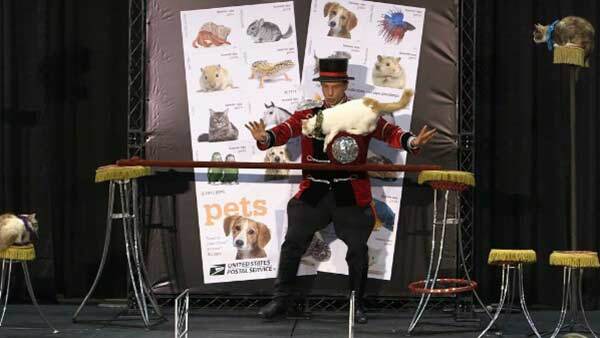 The first-day-of-issue dedication ceremony for the Pets Forever stamps took place at the SuperZoo National Pet Retailers Show at the Mandalay Bay Resort in Las Vegas. "More than half of all U.S. homes have at least one pet, and that number increases every year. The most common are cats and dogs, but all types of pets provide love, happiness and companionship for their owners," said Postal Service Chief Marketing and Sales Officer James Cochrane. Photos include a puppy, betta fish, iguana, hamster, goldfish, parrot, guinea pig, tortoise, rabbit, kitten, corn snake, mice, hermit crab, chinchilla, gerbil, dog, parakeet, horse, cat and gecko.